In 1928 my Great-Grandfather became a market gardener, purchasing a small farm in the lake district. The family business was passed down to my Grandfather but he died in 1965, leaving my Grandma and my Great Aunt to carry on the family business until they eventually retired. My father, meanwhile, had decided that farming was not for him and had begun a career in computing. My Great Aunt died in 2002 and the following year my Grandma moved into a bungalow, following which the farm stood empty for a couple of years. In 2005 the family decided to sell it, thus beginning a mad scramble to remove anything which we wanted before the sale. Given that the farm had been in the family for 77 years, and that a lot of things apparently hadn't moved for at least the last 40, this was no quick job. What this has given me is an 'instant' collection of old farming equipment. Or, to put it another way, a long list of restoration projects (as if I didn't already have enough projects underway!). I wanted to try to keep some of these machines in the family (goodness knows why! ), but actually restoring them is a longer term aim, so don't hold your breath. The 'rescue' phase took several weekends between August and October 2005. Progress was not helped by the 600-mile round trip each time. A few smaller items came back by car each weekend, but the two 'big moves' came on the weekend of September 3rd/4th, when I hired a Luton van to move the 'small' things, and on Sunday 2nd October, when I hired a flat-bed lorry with hiab to move the 'big' things. In-between there was also a significant event on September 17th. © R. Hetherington 02/10/05. One of 222 tractors built at Banner Lane, Coventry, on Friday 16th July 1954, this example was initially sold to a Cumbrian farmer called William Wilkinson on July 21st (or possibly the 24th, the registration document is hard to read). My Grandfather became its second owner, registering it on 12th January 1963. The eventual plan is to fully restore this. In the shorter term, it will be made to work so that it can 'earn its keep' at its new home, a local farm. 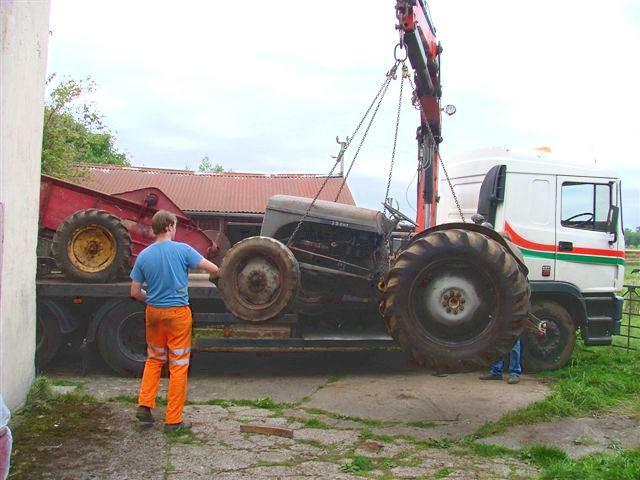 The photo shows the 'Flying Fergie' as it is loaded onto a lorry for transport - almost certainly the first time it had left Cumbria since it was new, 51 years previously. Believed to be model '712'. Photo © P. Hetherington 30/05/05. This was bought second-hand sometime between 1967 and 1969; in the 1969 accounts it was valued at £50. 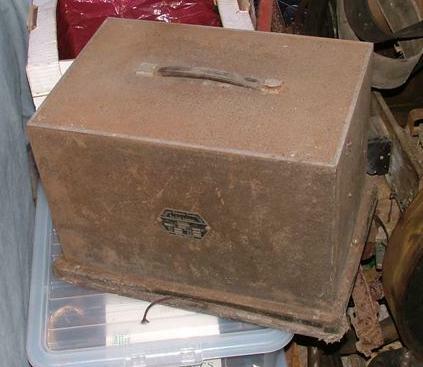 It is in very good condition (woodworm excepted!) and will be restored as a companion to the tractor. 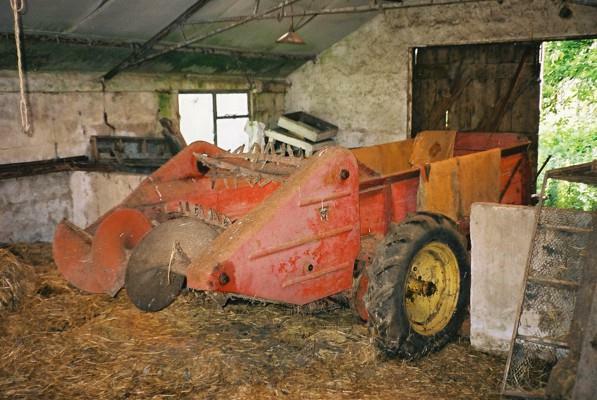 The photo shows the muck-spreader in the shed which it had occupied for as long as I can remember; a neighbouring farmer helped us to extract it with his tractor, after we removed a fence and cut back several trees which were blocking the door. I have been trying to establish what model it is. Having managed to get hold of a contemporary brochure, I'm pretty sure it is a model '712'. Armed with this knowledge, I can now look for a maintenance manual - which is a good thing to have before taking it to bits! Unfortunately the brochure gives no clue to the year of manufacture. It does, however, tell me that the capacity is 75 bushels and that the lever controls the feed rate (5, 10, 15 or 20 loads per acre). Photo © P. Hetherington 28/08/05. This photo shows it on the farm before we extracted it from the lean-to where it had been for at least 25 years. I'll try to get a better photo in due course. A nice machine this. The design dates back to horse-drawn days although this example has only ever been drawn by tractor, at least in our ownership. I'm told that as it is badged as a Lister-Blackstone it can be no older than 1946. 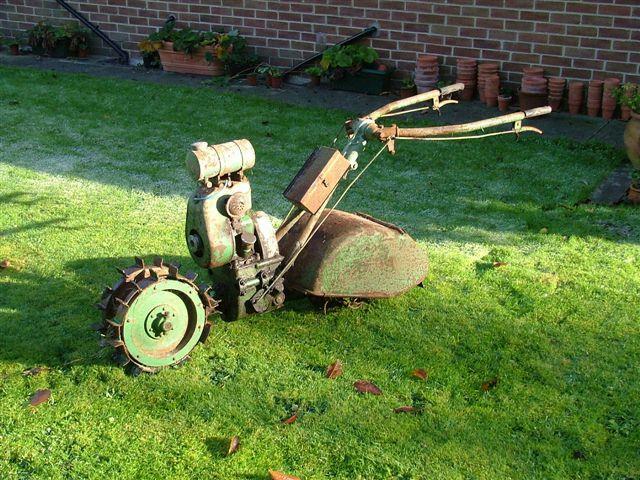 My father can remember it replacing an earlier model, so I suspect that it was bought second-hand during the 1950s. 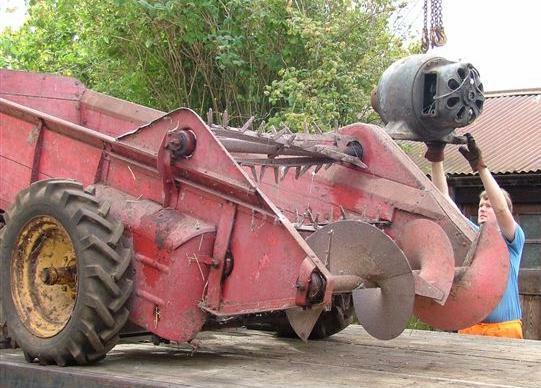 This requires a full overhaul and restoration, including some replacement tines. However, the overall condition is fairly reasonable. More details on the history of Blackstone are available from the Blackstone Engine & Machinery website. Photo © Hetherington collection c.1930s. Photo © P. Hetherington 02/10/05. A fabulous old machine, it was originally horse drawn but was later modified for use with a tractor. 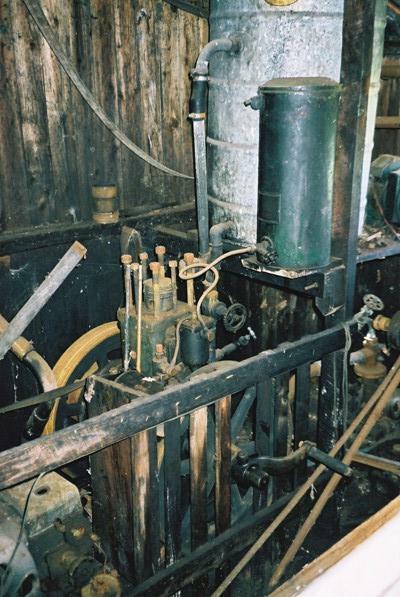 The first photograph shows this in use on the farm, probably during the 1930s. The shape of the hood looks somehow different, but we think that must be a trick of the light. 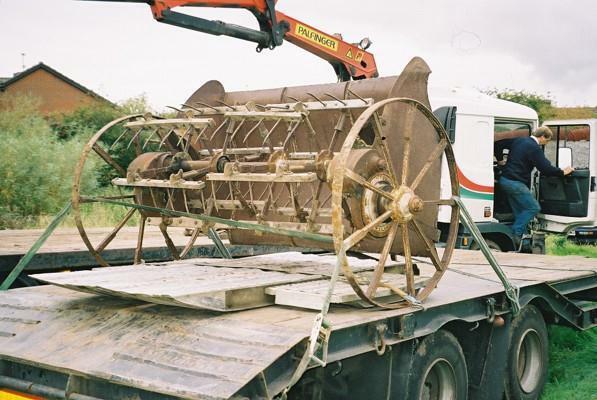 The full picture (click to view) shows it being pulled by a very rare Armstrong-Whitworth car chassis, which was used on the farm before the arrival of the first tractor. A few parts of this chassis have survived and will be passed on to a museum. The second picture shows it at the back of the 'lean-to' shed, unfortunately this only provided it with limited shelter from the elements. 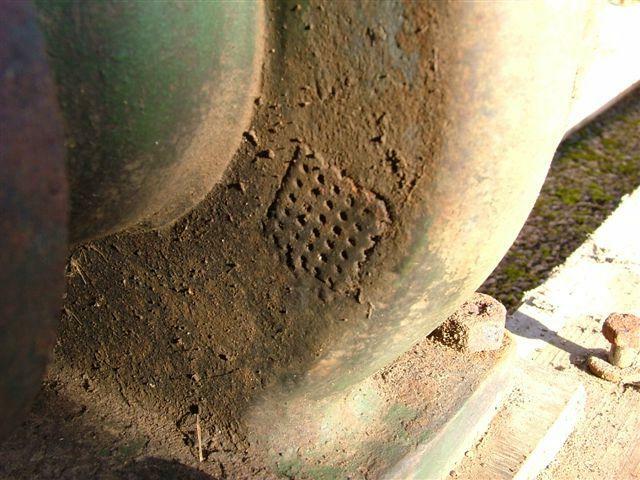 Despite this, traces of the original lining are still visible in places. It must have been quite striking when new, and hopefully one day it will be again. However, the bodywork needs quite a bit of attention, and the wheels are particularly poorly. The third photograph shows it about to be unloaded at its new home following the 'big move'. Serial No. CA&A 1033 A2. J.A.P. 1-cylinder 4-stroke air-cooled 5HP petrol engine. 2-speed gearbox: low 1.25mph, high 1.75mph. 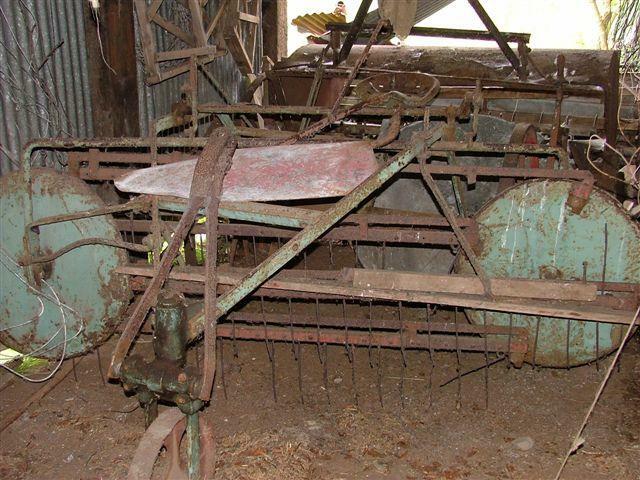 The larger of two cultivators / rotavators, we now think that this was probably bought new. We have a 1949 data sheet for a model 'B' stamped with the name of the dealer who almost certainly supplied this machine: Rickerby Ltd., 33 Botchergate, Carlisle. My Dad thinks that this one might have been an ex-demonstrator model. Photo © P. Hetherington 30/05/05. Production of this model began in 1949 with number 1001, so we have the 33rd one built. By 1950 they had reached number 1160, but the highest numbered known survivor is 1165 and production ceased during 1950. Exact numbers are uncertain, but there are probably only 4 or 5 survivors. Quite a rare machine. The photo was taken in the garage at the farm, where it had stood for quite a few years. It is rather heavy, and the tyres are both flat and perished to the extent that they almost prevented the wheels from turning, which made moving it extremely difficult. My Grandfather once caught his foot in this machine and suffered quite serious injuries, which I must confess leaves me with mixed feelings about this machine. Update: In 2008 I bought some brand new tyres and inner tubes for this machine; these are now awaiting fitting, though I may not do so until it comes to time for actual restoration. Serial No. CA&A 9015 C.
J.A.P. 2A 98cc 4-stroke engine. Engine No. 2AC9878CS. The smaller machine was designed to work between the previously planted rows. It was bought for £100 in the year ending 30 September 1957, but was never a great success and fell into disuse during the early 1960s. We rescued it from one of the farm out-buildings where, fortunately, it had stayed fairly dry. 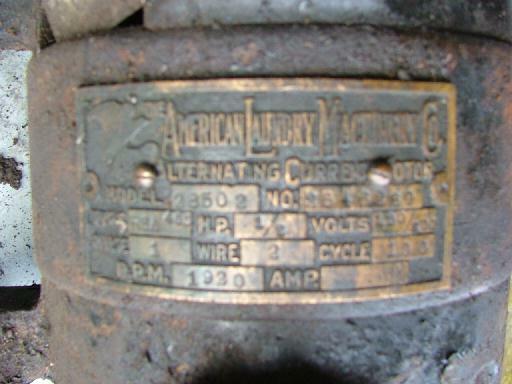 There are more details and photographs of this rare and probably unique machine here. More information on the history of Clifford can be found here and here. 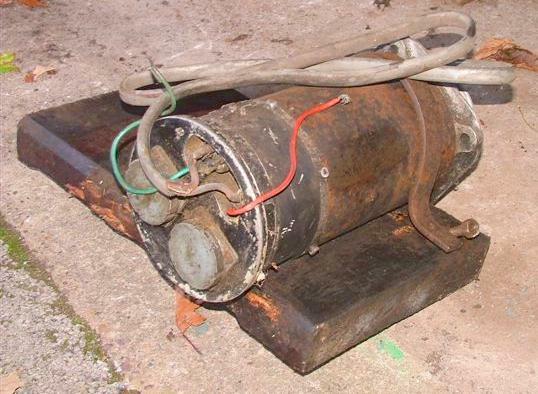 This is the only example of a Model C known to the Clifford Register, and before we rescued it in 2005, they had no record of such a model ever existing! The serial number probably indicates that this is the 15th example built, although as there is no record of this numbering series being used this is purely speculation. The year of manufacture is also open to conjecture. It is fitted with a JAP carburettor which apparently dates the engine to 1951 or earlier, although the machine itself could be slightly later. It is painted in a shade of green which Clifford generally stopped using around 1955. 2008 Update: My Dad has decided to take on the restoration of this machine. I'll add some more photos to the website as things progress. No. CS42537, Spec. 203/12, 3.5 HP, 650 RPM. Photo © P. Hetherington 30/05/05. 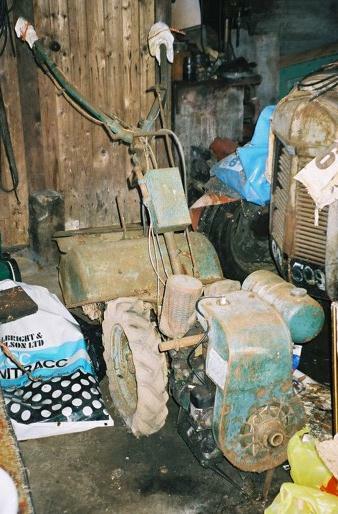 The photo shows the engine in the garage on the farm, before we further dismantled it for transport. The large galvanised barrel is the 'radiator' and the small green one is the fuel tank. Incidently my Dad tells me that this engine replaced a much older and larger National Gas Oil horizontal-crank engine. Now, that really would have been nice. Oh well! 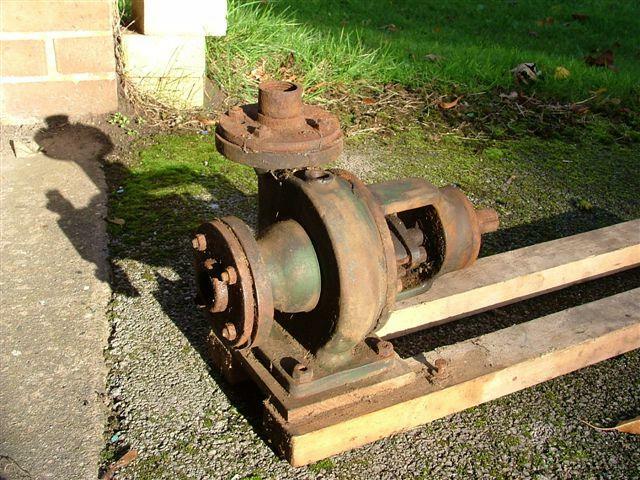 The largest of three stationary engines, this was used in the garage to provide electricity for the farm via a 110V d.c. generator, as well as to pump water from the river (for watering the gardens with) and to drive a belt-driven lathe. We had to let the lathe go (it was in poor condition and we had nowhere to store it), but we have kept the rest. 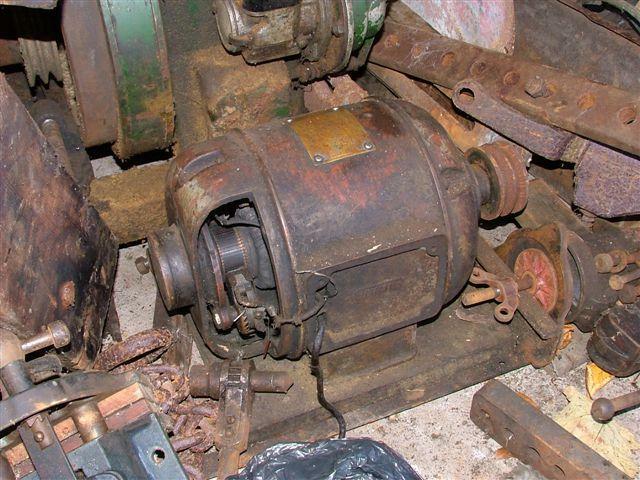 However, the engine had broken down and the cylinder block and head were removed some years ago. We have all of the bits, but there is obviously quite a bit to do before it will run again. 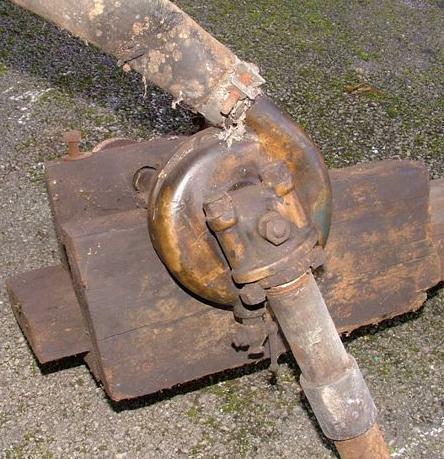 The engine was further dismantled for transport due to its weight, although we failed to remove the rear flywheel due to the 'key' being stuck, not helped by the presence of an additional non-original pulley made out of an old car brake drum! This prevents us from getting a good angle to bash the key out through the spoked flywheel. Any suggestions? Is there a special tool for the job? No. 4032LD16, 3 HP, 1500 RPM. Photo © P. Hetherington 30/05/05. The smaller Lister was used in the 'joiner's shop' to power the workshops, and also drove a milking pump for the adjacent cow-shed. 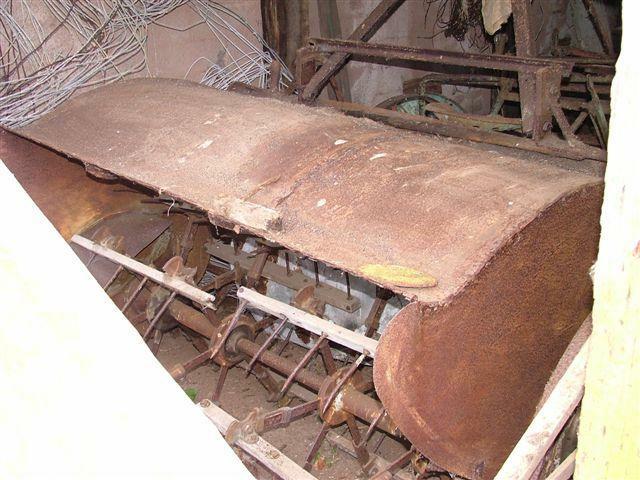 Its most bizarre feature was an exhaust pipe some twelve feet long, a home-made arrangement necessary due to the engine being located deep within a building. Perhaps the rain got in this way? Anyway, the engine is totally seized - and in proving this, we broke the starting handle - so making it run again will be a challenge. No. 508117, 2 BHP, 1000 RPM. Photo © P. Hetherington 30/05/05. This engine was mounted on a 'skid' along with a generator, making it nominally portable - although the combined weight is such that you need to have two people to even drag it along the ground! Although grotty, it seems to be basically complete and turns freely. No. 356604. Various parts are labelled with numbers beginning '3CK' so I presume that this is its type. It is designed for 1.5" pipe so it can obviously pump a fair volume. Temporarily re-assembled for the photograph. Photo © P. Hetherington 13/11/05. Showing the inside of the impeller housing. Photo © P. Hetherington 13/11/05. On 6/11/05 I decided to take a closer look at it. I took the impeller housing off the main part, and apart from one stud which sheared off (not insurmountable) the impeller housing is in better condition than I dared hope. There is no sign of cracking on the inside, so I'm not sure what the marks on the outside are. The bearings in the main part were most definitely seized though, so I oiled them and left them for another day. Photo © P. Hetherington 13/11/05. 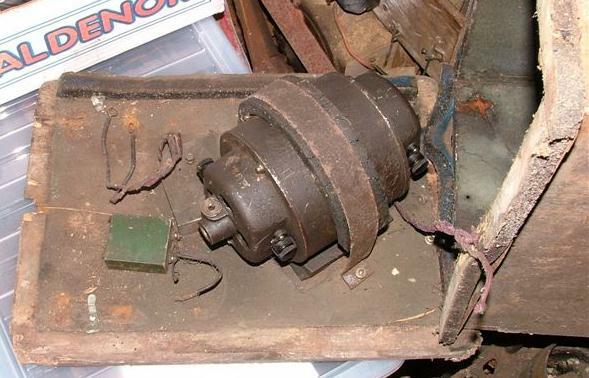 This was found on the workbench in the 'joiner's shop', and has a small electric motor (made by Hoover) attached to it. However, my current idea is to remove the motor and use the pump with one of the engines. My Dad tells me that this pump was bought at a sale but was then never actually used. It looks to be in good condition. Showing the symbol which is the only hope of identifing this pump. 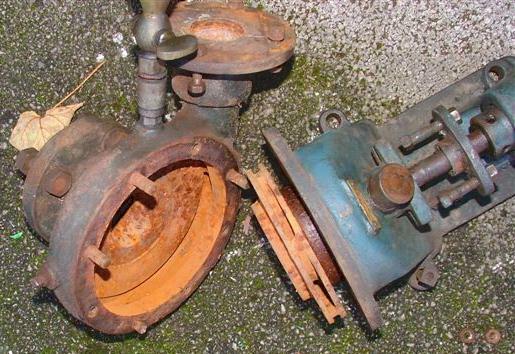 A less distinct version also appears further around the impeller housing. Photo © P. Hetherington 13/11/05. 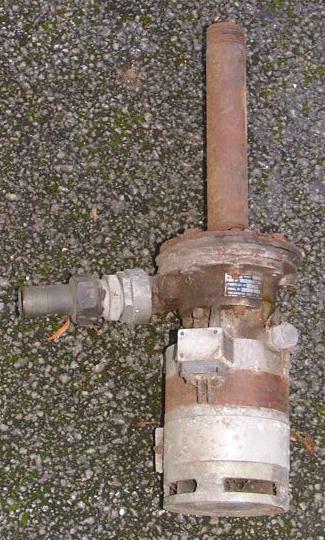 A smaller centrifugal pump of unknown origin. It has no name or number anywhere on it, but there is a curious symbol rather like a waffle - any ideas? One theory is that this was replaced by the Ruston pump, which might indicate that this one is damaged in some way. 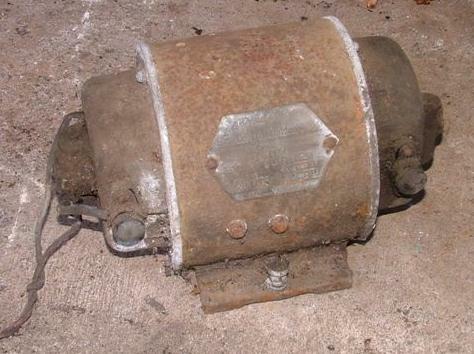 It is certainly seized up, and is missing a drive wheel and the filler for priming it. Photo © P. Hetherington 13/11/05. 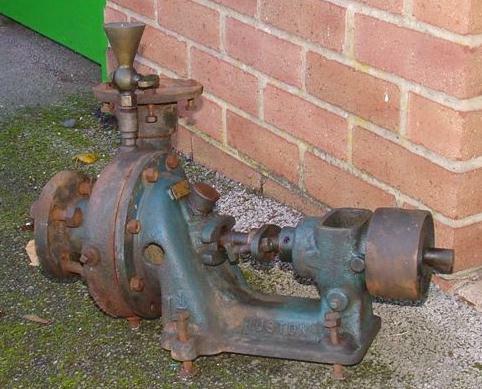 A very small pump which seems to be made entirely of brass. 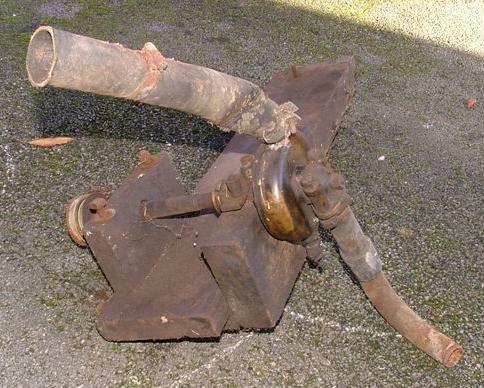 My Dad's theory is that this is off an old car and has been modified to the form pictured. If so, it probably shouldn't even be on this list, but I've put it here in the hope that someone can identify it for me. Model K15160A, Serial 011575, Volts 24. Photo © P. Hetherington 13/11/05. 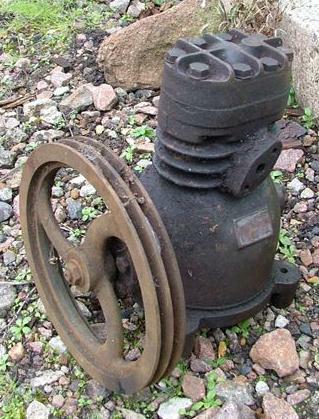 A small electric pump made by the Pulsometer Engineering Co. Ltd., designed for use in a well. There are two plates on it, and I don't know what all of the data means (although I think I can work out what 'Volts' are!). I don't know whether this can be made to work, time will tell. I just thought it looked interesting! Photo © P. Hetherington 13/11/05. 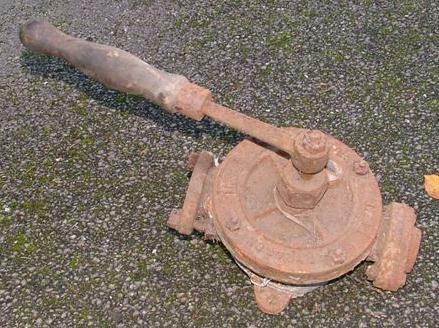 A small hand pump, possibly part of an old petrol pump? An internet search has drawn a complete blank so it is either a fabulously rare and interesting find, or something of no significance whatsoever. I have a theory on this... Anyway, it's seized but I can't believe that there is much wrong with it, I'll try dismantling it and soaking it in oil. Made by Higgs Bros., Birmingham. 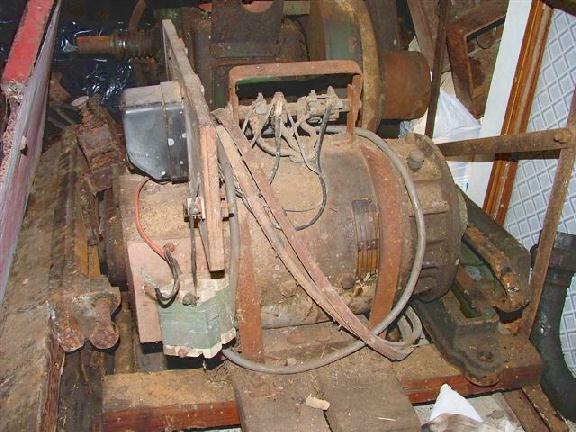 The photo shows it on the farm before we moved it; the Lister flywheel to the right gives an idea of its size. Photo © R. Hetherington 02/10/05. 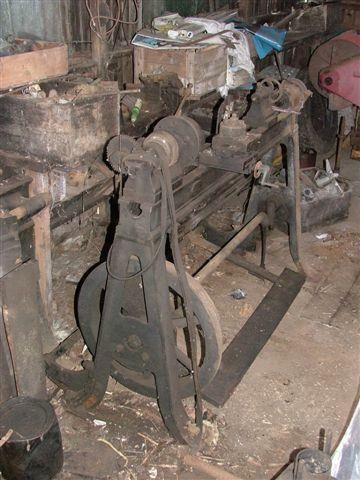 This was used in the 'potting shed' in conjunction with another engine which was sold off many years ago. 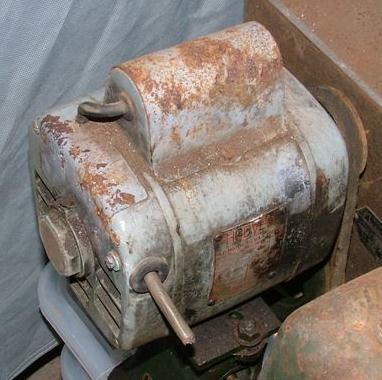 It appears to be the same as the green generator, although the drive wheel is a different size so it may be of a different rating. This one is painted grey. 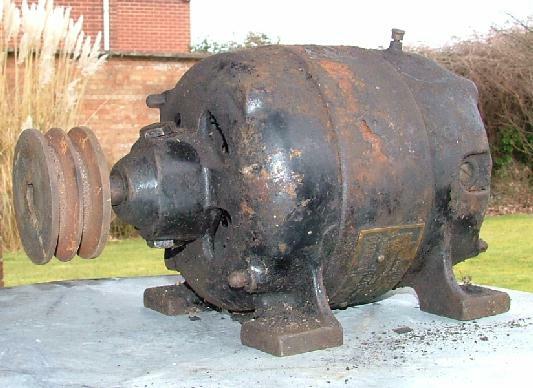 This was used as a secondary drive to a vacuum pump used for milking, the primary supply being a smaller motor using mains voltage. The milking apparatus had to be left due to time, space and practicality considerations. However, I hope to use the motor perhaps in conjunction with one of the Higgs generators. Getting the motor down itself was a challenge - it was on a loft above the 'wash house' and first had to be fetched across a rotten part of the floor (where the roof had been leaking), for which a very solid piece of timber came in handy. It then had to be lowered down to ground level using a block and tackle hung from one of the roof girders. It was quite a nervous operation but I'm pleased to say that the roof didn't fall down and the motor reached the ground safely! Photo © P. Hetherington 13/11/05. 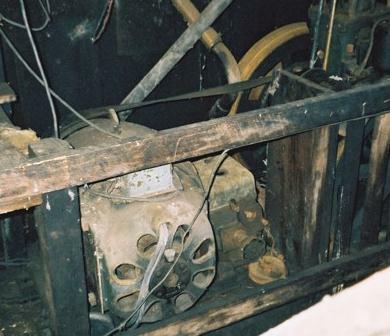 This small generator was used with the Lister 'LD' engine. Apart from '5U566' on the two end caps there are no identifying marks whatsoever. Any suggestions? No.M. 144340, Volts 22/31, H.P. -, Amps 25.0, Rating Cont., Frame X458F, RPM 1980, K.W. .775, Winding Shunt Int., B.S.S. 168.36. Photo © P. Hetherington 26/11/05. Photo © P. Hetherington 26/11/05. 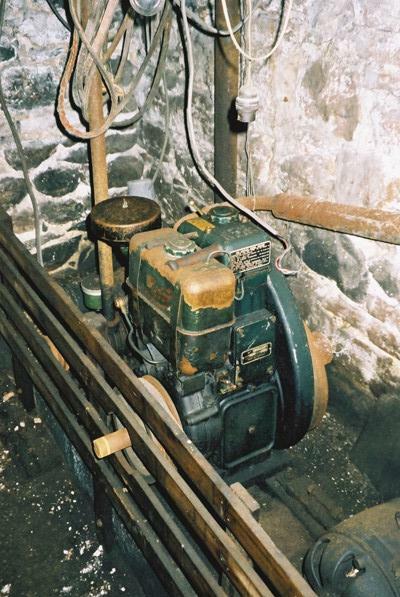 A medium-sized generator mounted on the same 'skid' as the Petter engine. No. 783289, Volts 230F, Speed 1450, Fuse 12, Model SE 500, Ref. J42, Amps 4.6, H.P. 1, Spec. E192. Photo © P. Hetherington 13/11/05. 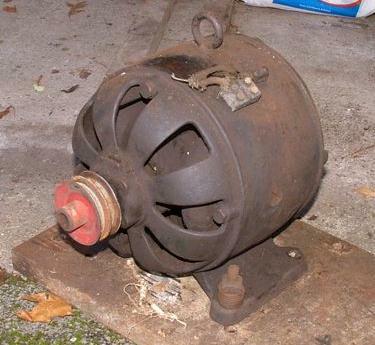 A medium-sized d.c. motor made by 'The Hobart Mfg. Co. Ltd., London, England'. I am told that this is from an 'SE500' food mixer of industrial proportions (50 quart) and dates from the 1960s or earlier. Thanks to Ruth at Hobart UK for this information. Mod. GM4,5, Nr. 256764, 100/140V, 3,1A, 1800 UMDR. Photo © P. Hetherington 13/11/05. 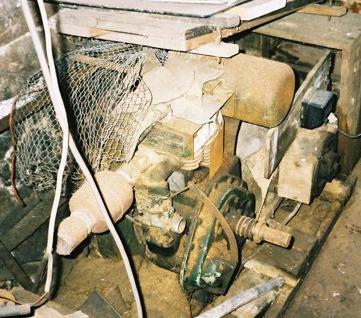 A medium-sized generator made by 'Siemens-Schuckert Werke'. This was also used in conjunction with the Lister 'LD' engine. Serial No. EGC 34962, Size 3DG3, 2500 RPM, Volts 14/32, Amps 9, Rating Continuous, Ref. No. 42U/506. Photo © P. Hetherington 13/11/05. Another small generator. BS 170, Patent Nos. 432035, 432521. No. SD 564 W2G, BHP 1/4, RPM 1435, Volts 200/210, Amps 1.5, Rating Cont., Custrs. Ref. No. 1-50. Photo © P. Hetherington 13/11/05. So, what am I doing with all of these motors and generators? Well, I have no idea, but I presumed that some of them might not work so I took all of the ones which looked vaguely ok in the hope of finding a few good ones. They'll allow the engines to be shown actually 'doing something', though I'm not sure what! BSS 170/39, Type 2298HAF603, Ser. No. 32981EB, Rating Cont., Volts 240/250, Phase 1, Cycles 50, Wdg. CAP ST, Amps 2.1, H.P. 1/4, R.P.M. 1435. Photo © P. Hetherington 13/11/05. Currently attached to the Lister water pump. Which is really the only reason I have it - although it does look vaguely operable, which is something. Photo © P. Hetherington 26/03/06. Photo © P. Hetherington 26/03/06. 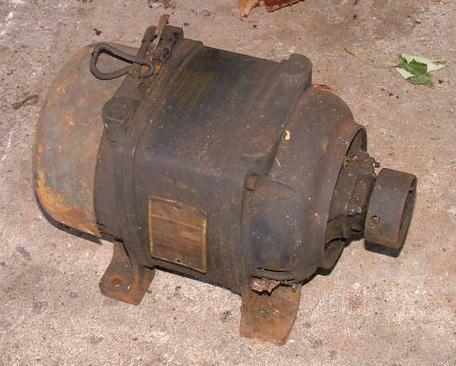 A more traditional-looking a.c. motor. This one nearly got left behind but I suddenly realised that, apart from the Hoover motor, everything else was d.c. and, although I have little use for such a thing, an a.c. motor is actually a very clever machine and I just decided that I should keep one. 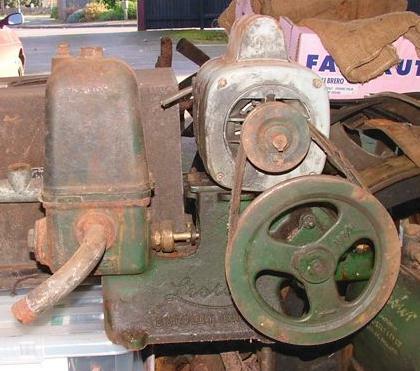 It didn't have a pulley wheel on it so we pinched this one from another AC motor which we decided not to keep (it was a nasty modern-looking green thing the name of which escapes me). Photo © P. Hetherington 13/11/05. Still in its original case as supplied, hence possibly never used. Certainly looks to be in good contiion. 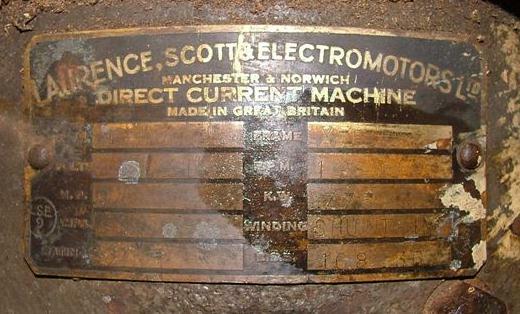 Made by 'Electro-Dynamic Construction Co. Ltd., London'. Photo © P. Hetherington 13/11/05. We still have the lid from this one's original case too, but the converter is seized up so has only been kept as a source of spares for the good one. Photo © P. Hetherington 27/11/05. 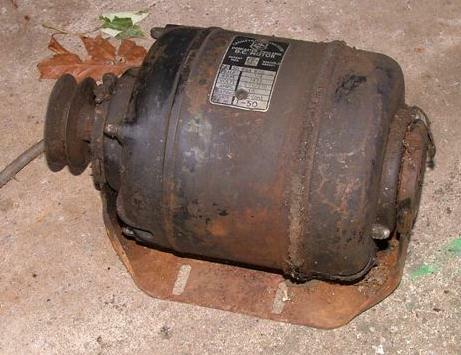 A small belt-driven compressor which, apart from the stamped figures as noted, is completely unidentifiable. Turning it over by hand, it seems to be in good working order. Quite what we'll use it for though, I have no idea. Photo © P. Hetherington 28/08/05. A real museum-piece in need of long-term preservation. This will be placed on loan to a suitable museum if one can be found. Apart from a couple of teeth missing on one cog (repairable, I'm told) this is in pretty good condition. Well, I've probably forgotten something, but I think that's about all of it. Links will be added to the above table as and when these projects progress.